KABC TV reporter Leslie Miller. Suzanne Marques and Gigi Graciette of LA FOX 11 TV news. 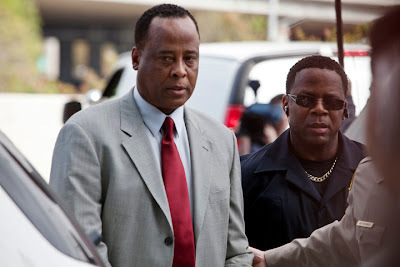 Dr. Conrad Murray arrived to court at the LA Airport Branch today. He was charged with involuntary manslaughter of pop star Michael Jackson. The judge set bail at 75K and took away Murray's passport. He also cannot administer heavy sedatives like propfol to anymore of his clients. Although he is still able to write prescriptions . 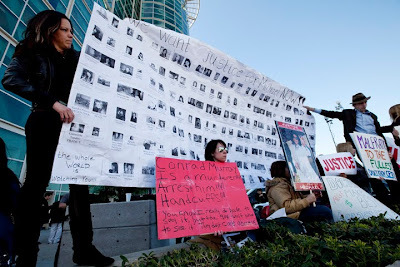 About 25 Michael Jackson fans showed up to yell at Dr. Murray as he entered the building. I had a quick lunch with Joseph Jackson, Michael's father, in the courthouse cafeteria. 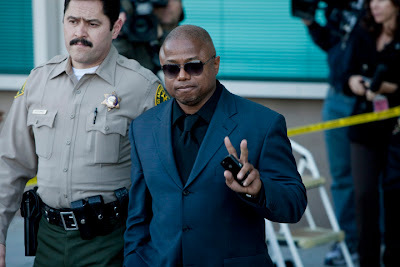 Randy Jackson, Michael's brother flashed me the peace sign as he left the courthouse.